The weather is changing around here and it’s definitely feeling like winter. Today was one of those days when we all just wanted to lounge around the house and stay warm! We did venture out and get our Christmas tree. It’s up and all decorated and making the house smell great. I love fresh pine! This recipe is a traditional Pennsylvania Dutch recipe. It’s super easy, at least the way I make it! You can use a ham hock and cook that down, but I didn’t have time and ham slices were on sale this week. Fill a stock pot with water. Add the potatoes and green beans and salt water. Bring to a boil. Remove the crust (is that what it’s called?) around the edge of the ham steak and the bone. Cut into bite sized pieces. 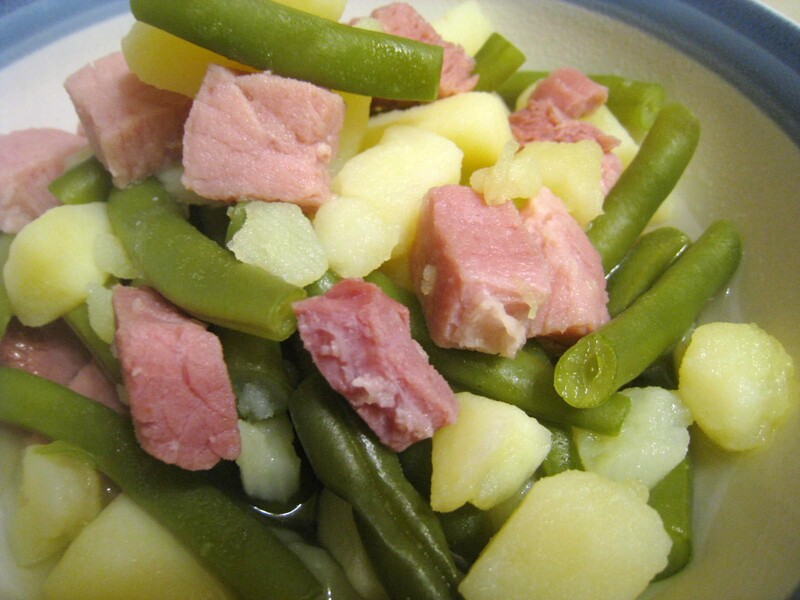 Once the potatoes are fork tender, turn down heat to low and add ham steak. Simmer until ham is warm. Season with fresh ground pepper and additional salt if necessary. Serve with a little broth and hot rolls. YUM!